For families that love entertaining, this home was designed for you! 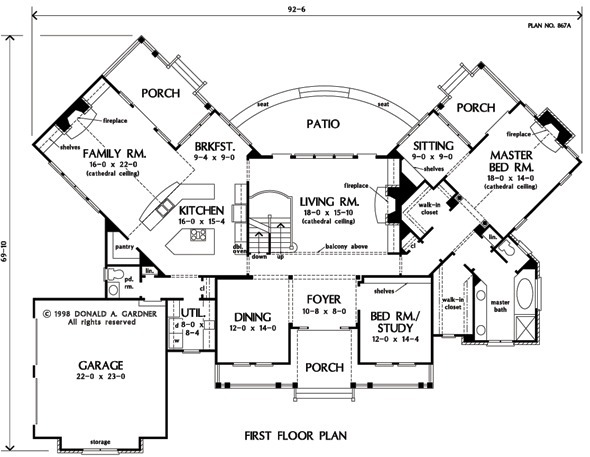 With both a family and living room and sprawling rear patio and porches, this layout provides privacy and convenience. Fireplaces in the living room, family room and master bedroom, alongside built-in shelves in the family and living rooms showcase custom details. Truly luxurious is the master suite. Complete with its own sitting area, two generous walk-in closets and a pampering bath, this suite is designed for indulgence. Also noteworthy is the private porch access off the bedroom. Upstairs, two bedrooms each have their own bathrooms and walk-in closets. Nearby is a large bonus room that provides a place for media or children to play, and the library with adjacent storage space is a perfect retreat for adults. 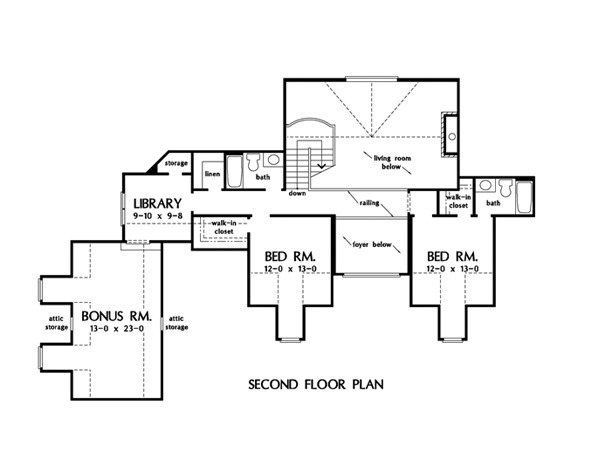 1st Floor: 2755 Sq. 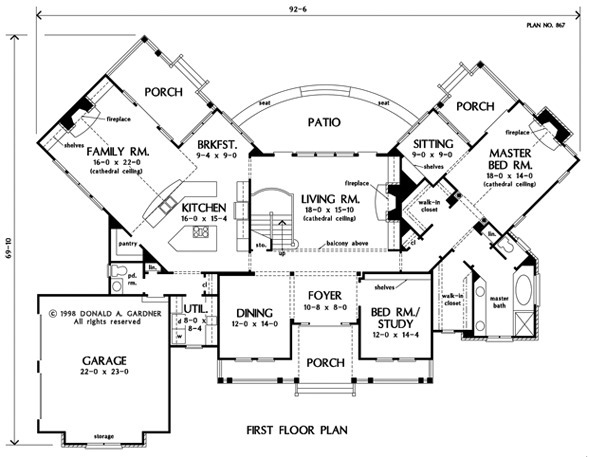 Ft.
House Dimensions: 92' 6" x 69' 10"
Foyer : 10' 8" x 8' 0" x 9' 0"
Great Room (Cathedral): 16' 0" x 22' 0" x 18' 0"
Kitchen : 16' 0" x 15' 4" x 9' 0"
Breakfast Room : 9' 4" x 9' 0" x 9' 0"
Utility Room : 8' 0" x 8' 4" x 9' 0"
Bonus Room : 13' 0" x 23' 0" x 9' 0"
Master Bedroom (Cathedral): 18' 0" x 14' 0" x 17' 0"
Porch - Front : 36' 8" x 4' 0" x 0' 0"
Porch - Left : 9' 4" x 17' 6" x 0' 0"
Porch - Right : 11' 4" x 9' 4" x 0' 0"
Deck / Patio : 21' 0" x 9' 4" x 0' 0"
Den / Library (Clipped): 9' 10" x 9' 8" x 9' 0"
Media Room : 12' 0" x 14' 4" x 9' 0"
Living Room (Cathedral): 18' 0" x 15' 10" x 19' 1"
Balcony : 18' 0" x 4' 6" x 9' 0"
Storage (1st Fl.) : 3' 4" x 6' 0" x 0' 0"
Storage (2nd Fl.) : 5' 0" x 3' 0" x 0' 0"
Other : 9' 0" x 9' 0" x 9' 0"